A police officer says it was "sheer luck that nobody was killed" after a banned driver smashed into a police dog van on a Sunderland street. John McCabe, 30, today admitted a string of driving offences after getting behind the wheel and leaving behind a trail of destruction in Sunderland. McCabe dragged a police officer down the road and nearly ran over another while attempting to avoid being caught during the incident on Sunday, December 30. The 30-year-old, who was without a driving licence and was disqualified until 2098, then ploughed into the side of a police dog van. 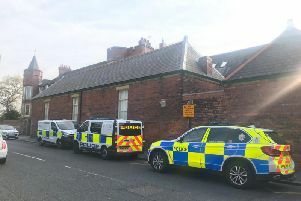 He appeared at Newcastle Crown Court today charged with more than a dozen offences including offences including causing serious injury by dangerous driving, driving without insurance, and failing to stop after an accident. McCabe, of Fordenbridge Road, Sunderland, pleaded guilty to all offences and is due to be sentenced on March 19. Police dog Kassey, who was in the van at the time of the smash, recovering at home. Sergeant Alan Keenleyside, of Northumbria Police’s Motor Patrols Uunit, said: "McCabe put his life and the lives of others in danger by flouting the law and showing a complete disregard to other motorists. "He threatened the livelihoods of other road users and caused a great deal of fear as a result of his irresponsible and erratic driving. "When confronted by police, he attempted to drive off - dragging an officer down the road and almost running over another in a bid to evade capture. "He then caused serious injury by crashing into a police dog van, which resulted in the handler being ejected out of the window upon impact, suffering broken ribs and significant injuries to his eye. "It was sheer luck that nobody was killed as a result of McCabe’s action on that morning and he must now deal with the consequences." It was shortly before 11am on December 30, when police received a report of dangerous driving on Hylton Road. Officers were called out after a silver Vauxhall Corsa driven by McCabe collided with another vehicle. He made off and then went on to crash the car into a garage in the Gorse Road area of the city. There he was met by two police officers – one of which attempted to arrest him - but McCabe managed to force his way back into the Corsa and reversed, dragging the officer along the road and almost ploughing into another. Shortly after that, McCabe smashed into a police dog van. The collision saw the officer – a dog handler – thrown through the window of the vehicle, suffering three broken ribs and shards of glass in his eye as a result. A police dog and two puppies were also in the van at the time of the collision – but thankfully were uninjured. McCabe and a female passenger were both taken to hospital with serious but non-life threatening injuries after officers managed to free the pair from the wreckage. He was later arrested and charged. McCabe pleaded guilty to causing serious injury by dangerous driving, driving while disqualified, driving without insurance, failing to provide a specimen, two charges of failing to stop after an accident and two offences of failing to report an accident. He was remanded in custody until sentencing.